This adorable and cuddly Golden Retriever puppy, named Lombard, began his journey as a guide dog when he was 10 weeks old. 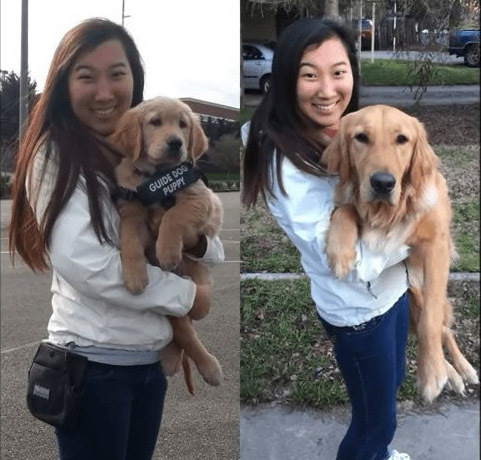 During his training, his raiser, Hana Kim, documented one second from each day from puppyhood to his formal training. As a puppy raiser, it is Hana’s job to set the foundational training which includes basic commands, manners, and socialization. A puppy raiser spends approximately 12-15 months with the dog making sure that he/she is ready for the next step in their training. Once they go back to formal training, they learn to wear a harness and the actual skills to become a guide dog. Lombard was being trained for a very important job and had very big shoes to fill. However, being a guide dog is not for every dog. It was not for Lombard. The high stress working environment was too much for Lombard’s soft personality. Lombard became anxious which made him itch himself, chew on his tail/legs, and shake all the time. He also developed ball obsession where he would fixate on balls. Lombard was officially released from the guide dog in training program in January 2016. Lombard flunks out of Guide Dogs for the Blind. You can learn more about Guide Dogs for the Blind by CLICKING HERE. In this video, Lombard’s trainer, Hana Kim, documented one second from each day of Lombard’s journey to become a guide dog — from puppy hood to his final days of formal preparation. Lombard winds up living happily ever after. Hana Kim, the dog trainer, adopts Lombard. She knew he wouldn’t make it as a guide dog but Lombard was still a great dog. He now spends his days chasing balls, destroying toys, getting dirty, and going hiking. Hana is also working on certifying him to become a therapy dog so that Lombard can help people in his own way. Are you looking for a dog? Why not get a rescue dog? You can even find Goldens like Lombard at PetFinder.com. 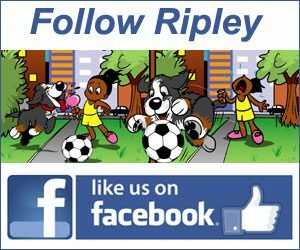 Here is another story about Golden Retrievers on Ripley The Dog. Watch a Great Pyrenees named General, the escape dog, unlocked his pen at the kennel where he was boarded. General then walked down a narrow hallway and came to a series of doors but they were no match for the animal, who used his mouth to work the handles. 2 videos of the Escape Dog.